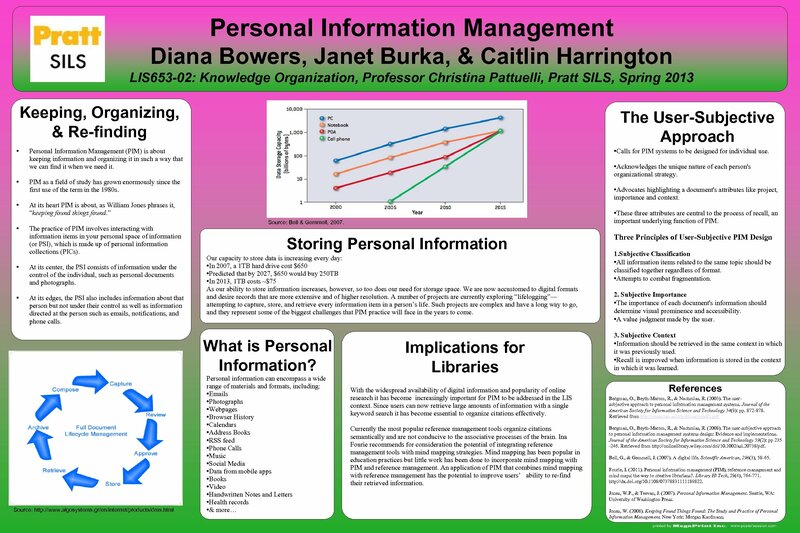 Personal Information Management Diana Bowers, Janet Burka, & Caitlin Harrington LIS 653 -02: Knowledge Organization, Professor Christina Pattuelli, Pratt SILS, Spring 2013 Keeping, Organizing, & Re-finding • • The User-Subjective Approach • Calls for PIM systems to be designed for individual use. Personal Information Management (PIM) is about keeping information and organizing it in such a way that we can find it when we need it. • Acknowledges the unique nature of each person's organizational strategy. PIM as a field of study has grown enormously since the first use of the term in the 1980 s. • Advocates highlighting a document's attributes like project, importance and context. At its heart PIM is about, as William Jones phrases it, “keeping found things found. ” The practice of PIM involves interacting with information items in your personal space of information (or PSI), which is made up of personal information collections (PICs). • At its center, the PSI consists of information under the control of the individual, such as personal documents and photographs. • At its edges, the PSI also includes information about that person but not under their control as well as information directed at the person such as emails, notifications, and phone calls. Source: Bell & Gemmell, 2007. Storing Personal Information Our capacity to store data is increasing every day: • In 2007, a 1 TB hard drive cost $650 • Predicted that by 2027, $650 would buy 250 TB • In 2013, 1 TB costs ~$75 As our ability to store information increases, however, so too does our need for storage space. We are now accustomed to digital formats and desire records that are more extensive and of higher resolution. A number of projects are currently exploring “lifelogging”— attempting to capture, store, and retrieve every information item in a person’s life. Such projects are complex and have a long way to go, and they represent some of the biggest challenges that PIM practice will face in the years to come. What is Personal Information? Source: http: //www. algosystems. gr/en/internet/products/dms. html • These three attributes are central to the process of recall, an important underlying function of PIM. Personal information can encompass a wide range of materials and formats, including: • Emails • Photographs • Webpages • Browser History • Calendars • Address Books • RSS feed • Phone Calls • Music • Social Media • Data from mobile apps • Books • Video • Handwritten Notes and Letters • Health records • & more… Implications for Libraries With the widespread availability of digital information and popularity of online research it has become increasingly important for PIM to be addressed in the LIS context. Since users can now retrieve large amounts of information with a single keyword search it has become essential to organize citations effectively. Currently the most popular reference management tools organize citations semantically and are not conducive to the associative processes of the brain. Ina Fourie recommends for consideration the potential of integrating reference management tools with mind mapping strategies. Mind mapping has been popular in education practices but little work has been done to incorporate mind mapping with PIM and reference management. An application of PIM that combines mind mapping with reference management has the potential to improve users’ ability to re-find their retrieved information. Three Principles of User-Subjective PIM Design 1. Subjective Classification • All information items related to the same topic should be classified together regardless of format. • Attempts to combat fragmentation. 2. Subjective Importance • The importance of each document's information should determine visual prominence and accessibility. • A value judgment made by the user. 3. Subjective Context • Information should be retrieved in the same context in which it was previously used. • Recall is improved when information is stored in the context in which it was learned. References Bergman, O. , Beyth-Marom, R. , & Nachmias, R. (2003). The usersubjective approach to personal information management systems. Journal of the American Society for Information Science and Technology 54(9): pp. 872 -878. Retrieved from http: //muse. tau. ac/il/publications/81. pdf Bergman, O. , Beyth-Marom, R. , & Nachmias, R. (2008). The user-subjective approach to personal information management systems design: Evidence and implementations. Journal of the American Society for Information Science and Technology 59(2): pp 235 -246. Retrieved from http: //onlinelibrary. wiley. com/doi/10. 1002/asi. 20738/pdf. Bell, G. , & Gemmell, J. (2007). A digital life. Scientific American, 296(3), 58 -65. Fourie, I. (2011). Personal information management (PIM), reference management and mind maps: the way to creative librarians? . Library Hi Tech, 29(4), 764 -771. http: //dx. doi. org/10. 1108/07378831111189822. Jones, W. P. , & Teevan, J. (2007). Personal Information Management. Seattle, WA: University of Washington Press. Jones, W. (2008). Keeping Found Things Found: The Study and Practice of Personal Information Management. New York: Morgan Kaufmann.